"And when the fullness of time was come, God sent His Only-Begotten Son" (Galatians 4:4), to save the human race. And when the ninth month had come after the Archangel Gabriel appeared to the Most Holy Virgin in Nazareth, saying: "Hail, thou that art highly favored...thou shalt conceive and bear a son" - at that time a decree went forth from Caesar Augustus that all the inhabitants of the Roman Empire be taxed. In accordance with this decree, everyone had to go to his own town and there be inscribed. Therefore righteous Joseph came with the Most Holy Virgin to Bethlehem, the city of David, for they were both of the royal House of David. But, there being a great many people in that small city for the census, Joseph and Mary could not find a lodging in any house and found shelter in a cave which the shepherds used as a sheepfold. In this cave, the Most Holy Virgin gave birth to the Savior of the world, the Lord Jesus Christ. Bearing Him without pain, as he was conceived without sin of the Holy Spirit and not of man, she herself wrapped Him in swaddling bands, worshipped Him as God and laid Him in a manger. Then righteous Joseph drew near and worshipped Him as the Divine Fruit of a virgin womb. Then the shepherds came in from the fields, directed by an Angel of God, and worshipped Him as Messiah and Savior. The shepherds had heard a multitude of Angels singing: "Glory to God in the highest, and on earth peace, goodwill among men" (St. Luke 2:14). At that time there also came Wise Men from the East, led by a wonderful Star, bearing their gifts: gold, frankincense, and myrrh, and worshipped Him as King of kings, offering Him their gifts (St. Matthew 2:11). Thus He came into the world Whose coming had been foretold by the Prophets and Who was born in the way that they had prophesied: of the Most Holy Virgin, in the city of Bethlehem, of the lineage of David according to the flesh, at the when there was no longer in Jerusalem a king of the tribe of Judah, but Herod the stranger was on the throne. After many types and prefigurings, messengers and heralds, Prophets, and righteous men, Wise Men and kings, finally He appeared, the Lord of the world and King of kings, to perform the work of salvation of mankind that could not be performed by His servants. May His be Eternal Glory and praise! Amen. The Lord Jesus, born in Bethlehem, was first worshipped by shepherds and Wise Men from the East--the simplest and the wisest of this world. In our day also, those who most sincerely worship the Lord Jesus as God and Savior are the simplest and the wisest of this world. Twisted simplicity and crazed wisdom have always been enemies of Christ's Divinity and of His Gospel. But who were these Wise Men from the East? This question was closely investigated by Saint Dimitri of Rostov. He asserts that they were kings of small regions or groups of towns in Persia, Arabia, and Egypt. At the same time, they were greatly learned in astrology. The wonderful Star that heralded the Birth of the New King appeared to them. According to Saint Dimitri, this Star appeared nine months before the birth of the Lord Jesus; that is, at the time when the Most Holy Mother of God conceived Him. They spent these nine months in studying this Star, in preparing for the journey and in traveling. They arrived in Bethlehem very shortly after the Birth of the Savior of the world. One of them was called Melchior. He was old, withered, with long white hair and beard. He brought the Lord the gift of gold. The second man was called Caspar; ruddy of face, young and beardless. He brought the Lord the gift of frankincense. The third was called Balthazar; black-skinned and heavily bearded. He brought the Lord the gift of myrrh. After their deaths, their bodies (holy relics) were taken to Constantinople, from Constantinople to Milan and from Milan to Cologne. It can be added that these three Wise Men represented the three chief races of men that descended from Noah's three sons: Shem, Ham, and Japheth. The Persian represented Japheth, the Arabian Shem, and the Egyptian Ham. Thus it can be said that, through these three, the whole human race worshipped Our Incarnate Lord and God. 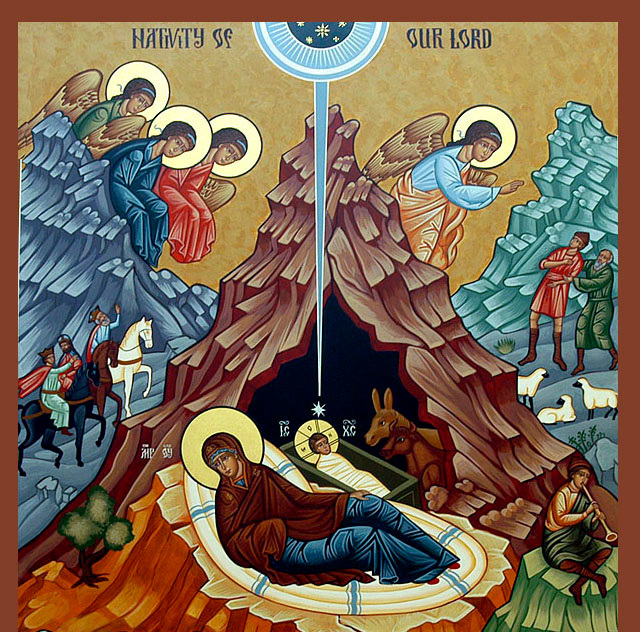 --on the birth of the Lord, the Son of God. The Only-Begotten Son of God, my brethren, begotten in eternity of the Father without a mother, was born in time of a Mother without a father. That first begetting is an unfathomable mystery of the Holy Trinity in eternity, and this second birth is an unfathomable mystery of God's power and love for mankind in time. The greatest mystery in time corresponds to the greatest mystery in eternity. Without probing with the light of our small understanding into this greatest of mysteries, let us be content, my brethren, with the discovery that our salvation had its origin not from men nor from the earth but from the greatest heights of the invisible, divine world. Such is God's mercy and such is man's greatness, that God the Son Himself came down from eternity into time, from heaven to earth, from the Throne of Glory to the shepherd's cave, solely to save man, to cleanse him from sin and to lead him back to Paradise. "I came forth from the Father", where He had everything, "and am come into the world", that could give Him nothing. The Lord was born in a cave, to show that the whole world is a dark cave that only He can illumine. The Lord was born in Bethlehem -- the House of Bread -- to show that He is the Only Bread of Life worthy of True men. A BLESSED AND HAPPY CHRISTMAS TO ONE AND ALL!